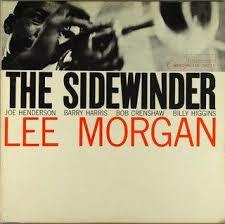 The Sidewinder is a 1964 album by jazz trumpeter Lee Morgan, recorded at the Van Gelder Studio, Englewood, New Jersey. It was released on the Blue Note label as BLP 4157 and BST 84157. The title track “The Sidewinder” was one of the defining recordings of the soul jazz genre, becoming a jazz standard. An edited version was released as a single. The album became a huge seller, and highly influential – many subsequent Morgan albums, and other Blue Note discs, would duplicate (or approximate) this album’s format, by following a long, funky opening blues with a handful of conventional hard bop tunes. Record producer Michael Cuscuna recalls the unexpected success: “the company issued only 4,000 copies upon release. Needless to say, they ran out of stock in three or four days. And ‘The Sidewinder’ became a runaway smash making the pop 100 charts.” By January 1965, the album had reached No. 25 on the Billboard chart.The title track was used as the music in a Chrysler television advertisement and as a theme for television shows. Edward Lee Morgan (trumpeter) was born on July 10, 1938 in Philadelphia, Pennsylvannia and passed away on February 19, 1972 in New York City. Lee Morgan was the youngest of Otto Ricardo and Nettie Beatrice Morgan’s four children. Originally interested in the vibraphone, he soon showed a growing enthusiasm for the trumpet. Morgan also knew how to play the alto saxophone. On his thirteenth birthday, his sister Ernestine gave him his first trumpet. His primary stylistic influence was Clifford Brown, who gave the teenager a few lessons before he joined the Dizzy Gillespie Big Band at 18, and remained a member for a year and a half, until the economic situation forced Dizzy to disband the unit in 1958. He began recording for Blue Note Records in 1956, eventually recording 25 albums as a leader for the company, with more than 250 musicians. He also recorded on the Vee-Jaylabel. He was a featured sideman on several early Hank Mobley records, as well as on John Coltrane’s Blue Train (1957), on which he played a trumpet with an angled bell (given to him by Gillespie) and delivered one of his most celebrated solos on the title track. Joining Art Blakey’s Jazz Messengers in 1958 further developed his talent as a soloist and composer. He toured with Blakey for a few years, and was featured on numerous albums by the Messengers, including Moanin’, which is one of the band’s best-known recordings. When Benny Golson left the Jazz Messengers, Morgan persuaded Blakey to hire Wayne Shorter, a young tenor saxophonist, to fill the chair. This version of the Jazz Messengers, including pianist Bobby Timmons and bassist Jymie Merritt, recorded the classic The Freedom Rider album. The drug problems of Morgan and Timmons forced them to leave the band in 1961, and the trumpeter returned to Philadelphia, his hometown. According to Tom Perchard, a Morgan biographer, it was Blakey who introduced the trumpeter to heroin, an addictive drug that impeded his career trajectory. On returning to New York in 1963, he recorded The Sidewinder (1963), which became his greatest commercial success. The title track cracked the pop charts in 1964, and served as the background theme for Chrysler television commercials during the World Series. The tune was used without Morgan’s or Blue Note’s consent, and intercession by the label’s lawyers led to the commercial being withdrawn. Due to the crossover success of “The Sidewinder” in a rapidly changing pop music market, Blue Note encouraged its other artists to emulate the tune’s “boogaloo” beat. Morgan himself repeated the formula several times with compositions such as “Cornbread” (from the eponymous albumCornbread) and “Yes I Can, No You Can’t” on The Gigolo. 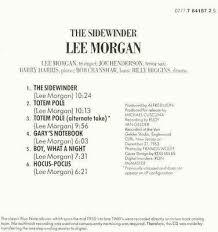 According to drummer Billy Hart, Morgan said he had recorded “The Sidewinder” as filler for the album, and was bemused that it had turned into his biggest hit. He felt that his playing was much more advanced on Grachan Moncur III’s essentially avant-garde Evolution album, recorded a month earlier, on November 21, 1963. After this commercial success, Morgan continued to record prolifically, producing such works as Search for the New Land (1964), which reached the top 20 of the R&B charts. He also briefly rejoined the Jazz Messengers after his successor, Freddie Hubbard, joined another group. Together with John Gilmore, this lineup was filmed by the BBC for seminal jazz television program Jazz 625. As the 60′s progressed, he recorded some twenty additional albums as a leader, and continued to record as a sideman on the albums of other artists, including Wayne Shorter’s Night Dreamer; Stanley Turrentine’s Mr. Natural; Freddie Hubbard’s The Night of the Cookers; Hank Mobley’s Dippin’, A Caddy for Daddy, A Slice of the Top, Straight No Filter; Jackie McLean’s Jackknife and Consequence; Joe Henderson’s Mode for Joe; McCoy Tyner’s Tender Moments; Lonnie Smith’s Think and Turning Point; Elvin Jones’ The Prime Element; Jack Wilson’s Easterly Winds; Reuben Wilson’s Love Bug; Larry Young’s Mother Ship; Lee Morgan and Clifford Jordan Live in Baltimore 1968; Andrew Hill’s Grass Roots; as well as on several albums with Art Blakey and the Jazz Messengers. He became more politically involved in the last two years of his life, becoming one of the leaders of the Jazz and People’s Movement. The group demonstrated during the taping of talk and variety shows during 1970-71 to protest the lack of jazz artists as guest performers and members of the programs’ bands. His working band during those last years featured reed players Billy Harper or Bennie Maupin, pianist Harold Mabern, bassist Jymie Merritt and drummers Mickey Roker or Freddie Waits. Maupin, Mabern, Merritt and Roker are featured on the well-regarded 3-disc, Live at the Lighthouse, recorded during a two-week engagement at the Hermosa Beach club, California, in July 1970. Morgan was murdered in the early hours of February 19, 1972, at Slugs’, a jazz club in New York City’s East Village where his band was performing. Following an altercation between sets, Morgan’s common-law wife Helen More (a.k.a. Morgan), shot him in the chest onstage, killing him within moments. He was 33 years old.